Touchdown! As we landed in Cairo I pressed my face against the plane’s window. Was I really here? Yes, yes, yes! And happy to be here too. As we disembarked and were met by our tour coordinator, I greedily took it all in. Cairo is a bustling city, but the atmosphere was so different from anywhere I had ever been. Men hurrying about in gallabiya (traditional long robes worn by both men and women) or just chilling outside a cafe, smoking a sheehsa (water pipe). Groups of women in veils, chatting happily amongst themselves. But also lots of people in jeans and sport shirts, McDonald’s and Pizza Hut. It was both tradtitional and cosmopolitan. Relaxed and frenetic. The citadel (the heart of medieval Cairo) loomed in the distance. Beside me taxis zoomed by at insane speeds. There was an intense dry heat that lulled me into a very contented state of being. Just landed and I was already under its spell. All my excitement however could not mask the fact that I had just come off a veeery long plane ride, and was very, very hungry. When Nour, our cassanovish tour coordinator (he has 15 girlfriends and never sleeps), asked if we needed anything I immediately piped up, “Food!”. So he took us to a street side snack bar where we had two of the most classic and common of Egyptian foods — fuul and t’aamiyya. Appropriately enough (for me at least), Egyptians have fuul and t’aamiyya for breakfast. Hooray! My first egyptian breakfast food! Well, they have it throughout the whole day as well, but let’s not rain on my parade. We grabbed some goodies chosen by Nour and hopped back into our van. The picture above is a platter of t’aamiyya. Not seen in the picture is the big vat of oil in which they were fried. 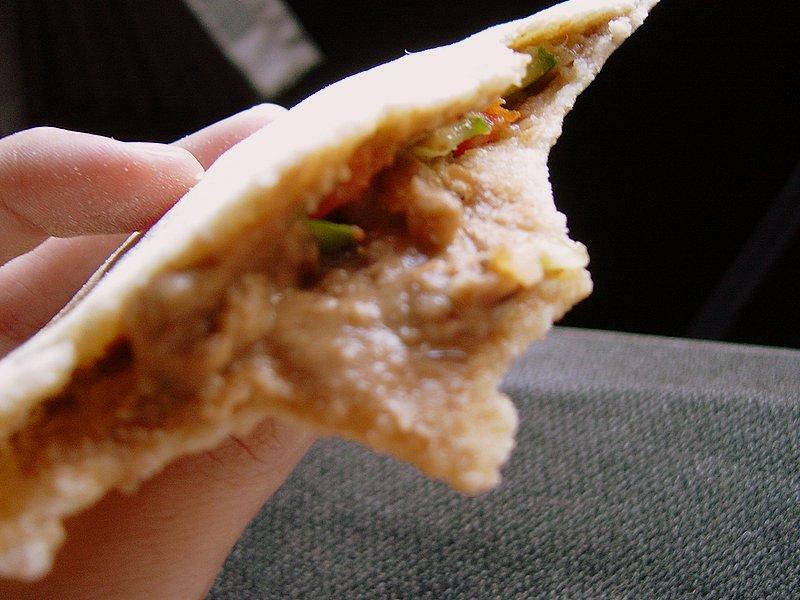 Below, is the t’aamiyya snugly ensconced in a pita, with chopped tomatoes, onions, parsely, and some tahina (sesame seed paste), half eaten by me. T’aamiyya is the Egyptian version of falafel. It’s more crisp though, and more green, owing to the fact that they have lots of coriander leaves or parsley together with the ground fava beans. It was definitely similar to the other falafels of my past, but had a slightly different taste…perhaps because it had more greens? Anyway, I loved it!Below is the fuul. 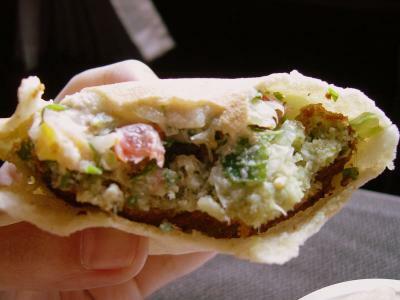 Also neatly spread into a pita, also with some chopped veggies, and also being eaten by me. I was on holiday, so it was “do everything, eat everything” time. Wahoo! Fuul is greenish brown Arabic fava beans. They are boiled and mashed to make a paste, which in turn can be mixed with a score of other ingredients from chickpeas to eggs. This would fall under your Mediterranean bean pastes I suppose, like hummus, but with a different flavor altogether…closer to the taste of the darker bean varieties. It became a quick favorite, and we had it many times throughout our trip. 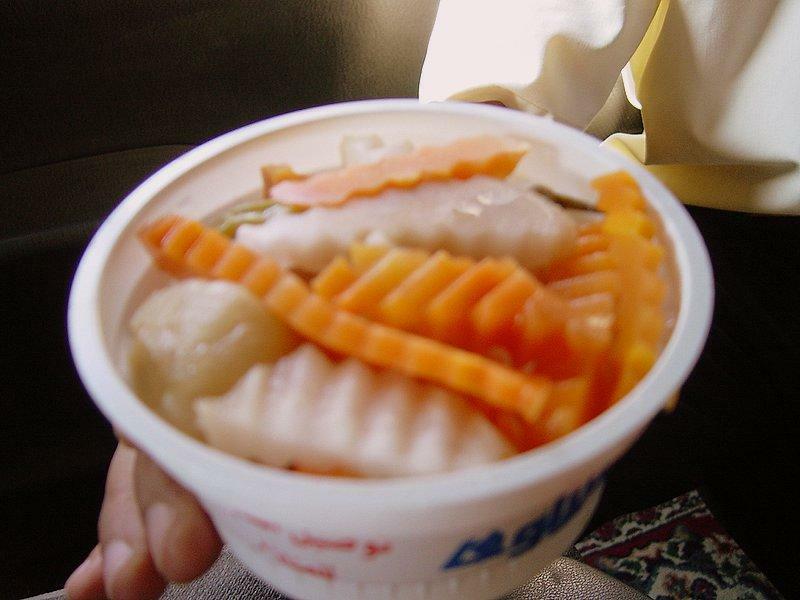 Together with the fuul and t’aamiyya, we had a side of pickled vegetables called turshi (pictured below). Their sour/sweet crunch went perfectly with the heavy nutty-ness of our bean based snacks. Our first meal in Egypt, though simple, was still a thrill. And looking back, probably one of my favorites. Jumping around the snack bar and pointing at all its offerings (and causing quite a stir in the process), stuffing our faces in a van that careened wildly at top speed, stopping in a side street to get some orange soda at a corner shop and meeting its cute proprietor Mohammed…all delicious fun. OH, great! this is beautiful and it's so great you loved the food here! I am living in Cairo right now and although I get a little tired of the fuul and taamiya, it's so great to pick up when I'm starving and in a rush. For a different variation of the fuul, I am lucky to live with a beautiful Eritrean cook and will post the Eritrean/Ethiopian version of fuul soon enough, as it is our Friday breakfast tradition!! 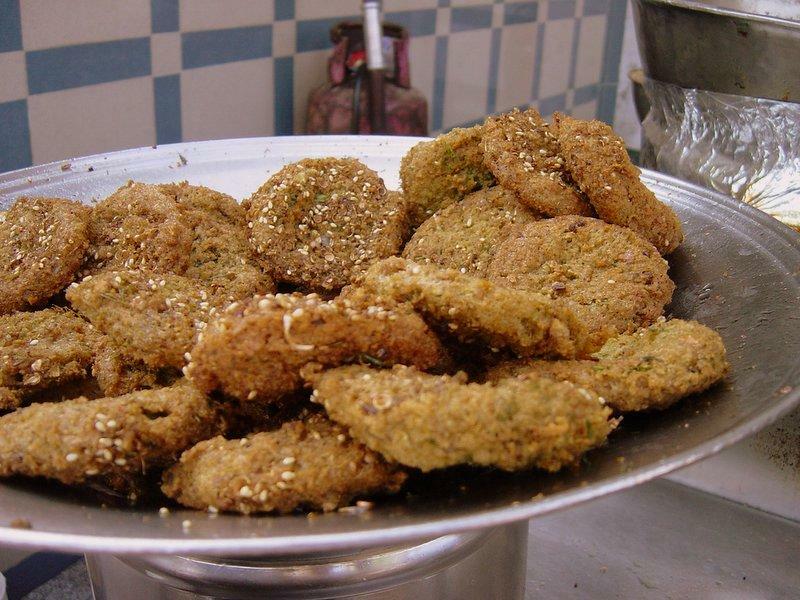 I found this page when Googling egyptian food – What a beauty! I leave for Cairo in 2 days and am hungry already. Many thanks for the pictures.